Belleisle House, in Ayr, was once the mansion house of the private estate of Belleisle. The house and gardens present looks are attributed to the Hamiltons of Pinmore, who took over the estate in the late 1700s. They acquired more land for the estate, and extended the mansion house to its present day form. Ayr Burgh Council purchased the estate in 1926 for £25,000, it has been opened to the public free of charge since. Next to the house is a pergola with tropical plants & walled garden. Work to convert the other side of the estate, to the Belleisle and Seafield golf courses, began in 1927. 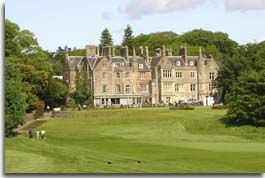 Belleisle Mansion House is now run as a hotel overlooking the golf courses. The hotel is being redesigned and extended with the work expected to be completed in 2016. See more at Hotels Ayr and large images at Parks Golf.